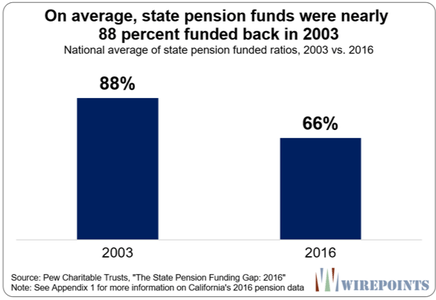 But a Wirepoints analysis of 2003-2016 Pew Charitable Trust and other pension data found that it’s the uncontrolled growth in pension promises that’s actually wreaking havoc on state budgets and taxpayers alike. Overpromising is the true cause of many state crises. Underfunding is often just a symptom of this underlying problem. Wirepoints found that the growth in accrued liabilities has been extreme in many states, often growing two to three times faster than the pace of their economies. It’s no wonder taxpayer contributions haven’t been able to keep up. The reasons for that growth vary state to state – from bigger benefits to reductions in discount rates – but the reasons don’t matter to ordinary residents. Regardless of how or when those increases were created, it’s taxpayers that are increasingly on the hook for them. Unsurprisingly, the states with the most out-of-control promises are home to some of the nation’s worst pension crises. Take New Jersey, for example. The total pension benefits it owed in 2003 – what are known as accrued liabilities – were $88 billion. That was the PV, or present value, of what active state workers and retirees were promised in pension benefits by the state at the time. Today, promises to active workers and pensioners have jumped to $217 billion – a growth of 176 percent in just 13 years. That increase in total obligations is four times greater than the growth in the state’s GDP, up only 41 percent. Many of the top-growth states – including New Jersey, Illinois, Kentucky and Minnesota – have high growth rates due to recent changes in their investment assumptions. But more honest accounting, i.e. lowering the investment rate, is hardly a comfort to the residents of those states. It simply reveals just how much in promises residents are – and always have been – on the hook for. And it’s not just the fiscal basket-cases that are in trouble. Accrued liabilities have skyrocketed in states across the country. Legislators continued to grow their obligations even as their states’ pension crises worsened during the 2003-2016 period. Twenty-eight states allowed their accrued liabilities to outgrow their economies by 50 percent or more. And pension promises in 12 states outgrew their economies by a factor of two or more. Pension promises were meant to be funded by a combination of employer (i.e. taxpayer) contributions, employee contributions and investment returns. But as promises have skyrocketed and assets have failed to keep up, funding shortfalls across the 50 states have jumped. The Pew data shows that unfunded state promises – known as unfunded liabilities – grew six times, to $1.4 trillion in 2016 from $234 billion in 2003. In all, states had just $2.7 trillion in assets in 2016 to cover accrued liabilities of $4.1 trillion. And that’s the rosy scenario. Most states use assumptions that underestimate the true size of the promises they’ve made to state workers. 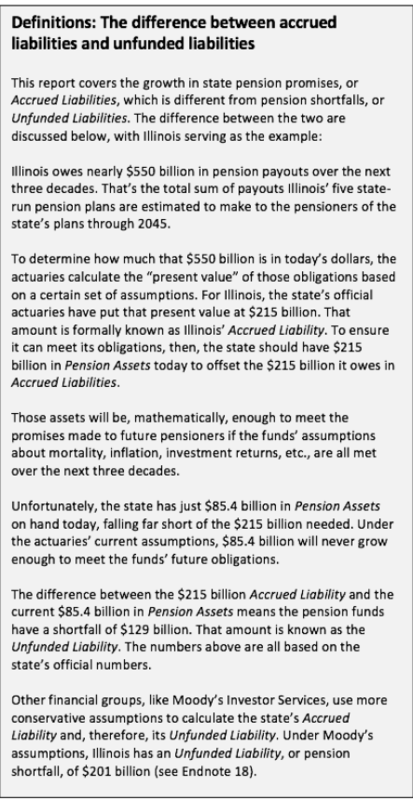 Under more realistic assumptions, the pension shortfalls are actually $1-$3 trillion larger. Those funding shortfalls are being piled onto ordinary residents. Government employee contributions are generally fixed and investment returns aren’t enough to dig most funds out of debt. So taxpayers are stuck holding the bag for the states’ massive unfunded liabilities. The Pew data covers 13 years of pension growth, a relatively short period when analyzing pensions. A longer-term data series is needed for a deeper analysis. Fortunately, Wirepoints was able to collect 30 years of Illinois pension data. The state’s long-term numbers show an even greater disparity between the growth in total benefits and what taxpayers can afford. Total promised benefits in Illinois are nearly 1,100 percent higher now than they were in 1987. In contrast, Illinois personal income – a proxy for GDP – was up just 236 percent during that 30-year period. 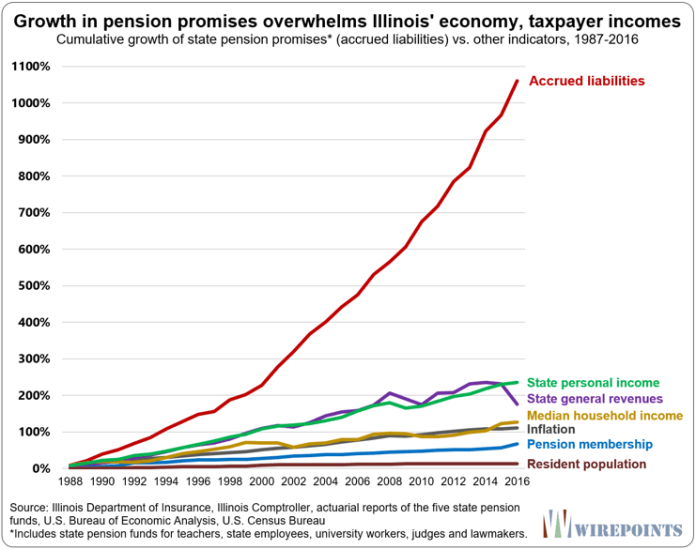 Illinois is the poster child for why the common narrative surrounding pensions – that crises are due to taxpayer underfunding – is false. The real problem has been the enormous growth in accrued liabilities across the nation. There’s no fixing pensions without dramatically scaling back that growth in retirement promises. At the top of the list are states like New Jersey, New Hampshire, Illinois, Nevada, Kentucky and Minnesota. 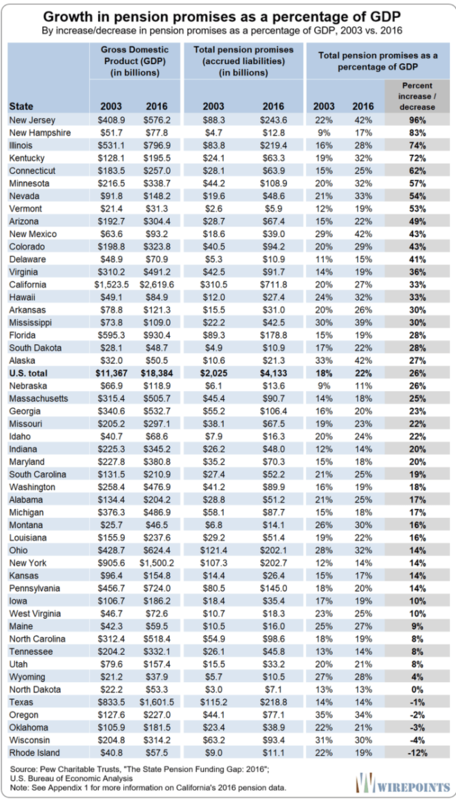 Several of those states have lowered their assumed investment rates as a result of their crises (see Endnote 3). All six states experienced accrued liability growth of more than 7 percent a year between 2003 and 2016. At the bottom of the list, states like Wisconsin, Maine, Michigan, Oklahoma and Ohio have all kept their accrued liability growth rate below 4 percent per year. That 3 percentage-point difference in annual growth is significant when the impact of compounding is considered over a 13-year period. It’s pushed pension promises up in the top states by 160 percent over the period. In contrast, the states with more moderate benefit growth grew their promises by a total of 60 percent or less. In many states, that’s made the difference between fiscal stability and financial crisis. A vast majority of states have experienced unsustainable pension benefit growth compared to their economies. In 28 states, accrued liabilities outgrew their economies by 50 percent or more between 2003 and 2016. And 12 states were totally overwhelmed by increases in their accrued liabilities. The total growth was more than double that of their economies. Again, it was New Jersey, New Hampshire, Illinois, Connecticut and Kentucky which were the most out-of-control. Those states have mature pension systems that have been in operation for decades. There’s little reason, in theory, for their promised benefits to grow so much faster than their economies. In some cases, it’s due to more honest reporting of their true liabilities. Other states have seen robust increases in population – thereby necessitating some growth in services – but not enough to warrant the kind of increases in their pension obligations. Nevada’s population, for example, grew more than 25 percent. But that doesn’t justify the fact that its pension promises grew by more than two times the growth in the state’s GDP. Overall, only six states – Rhode Island, Wisconsin, Oklahoma, Oregon, Texas and North Dakota – experienced GDP growth that exceeded the growth in their accrued liabilities. 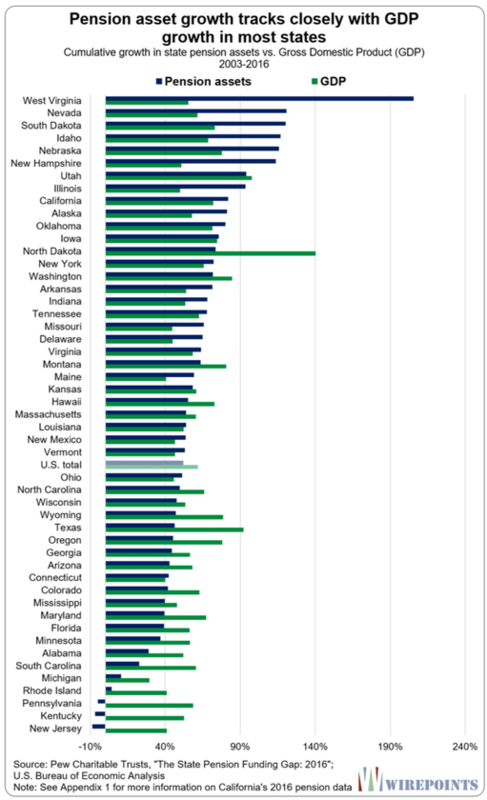 There is a stark contrast between the states at the top and bottom of the accrued liability growth chart. Many states with rapidly growing pension obligations are in crisis. Most states with slow-growing obligations are not. 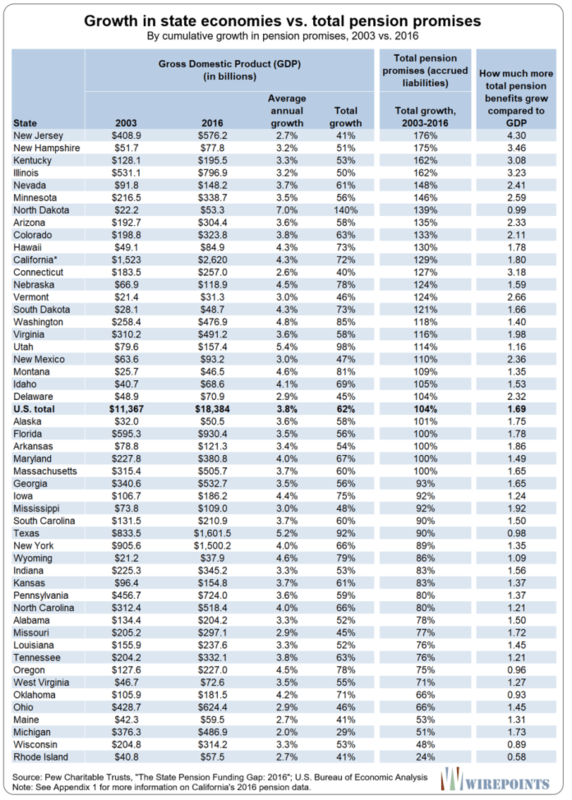 The five states with the largest growth in promises in the nation – New Jersey, New Hampshire, Illinois, Nevada and Kentucky – have all seen their benefits grow 150 percent or more since 2003. That explosive growth in benefits has overwhelmed many of those states’ economies and their residents’ ability to pay. Every one of the top 5 states has seen their pension benefits grow 2 to 4 times more than their GDP growth. 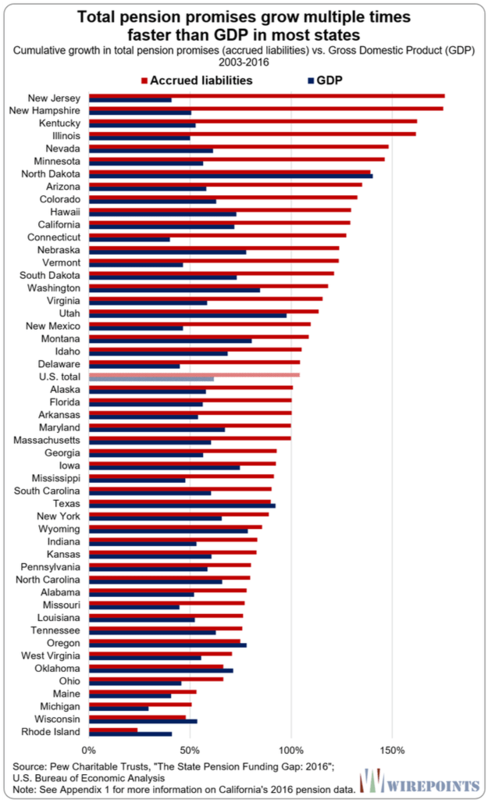 Growing pension obligations is also reflected in those state’s promises as a share of GDP. For example, Illinois pension promises have grown to 28 percent of GDP in 2016 from 16 percent of GDP in 2003, a 75 percent increase. New Jersey has seen its promises as a share of GDP skyrocket 96 percent, growing to 42 percent from 22 percent. 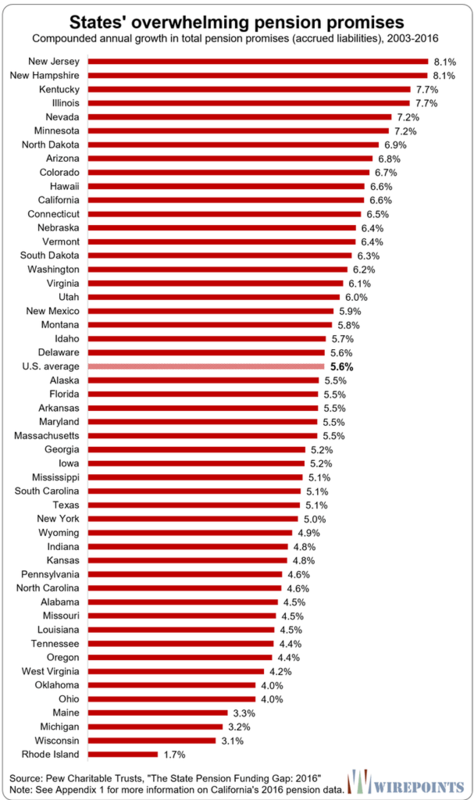 (See Appendix 3 for a full list of state accrued liabilities as a percent of GDP). Unsurprisingly, these states are also home to some of the nation’s worst pension crises. In 2016, New Jersey had the nation’s 2nd-worst credit rating and the worst-funded pensions in the nation – only 31 percent funded. Kentucky was right behind with a funded ratio of 31.4 percent. And Illinois followed closely with a funded ratio of just 36 percent and the lowest credit rating in the nation, just one notch above junk. In contrast, the lowest promise-growing states in the nation – Rhode Island, Wisconsin, Maine, Michigan and Oklahoma –all kept their annual accrued liability growth at 4 percent a year or less between 2003 and 2016. (See Endnote 3). That kept pension benefits from overwhelming those states’ economies. Take Wisconsin, for example. The state’s pension promises grew 48 percent over the time period, less than the state’s GDP growth, up 53 percent. And Rhode Island’s economy managed to grow faster than promised benefits. Benefits grew just 24 percent while the state’s economy grew 41 percent. A common factor among these low growth states is their more reasonable pension benefits and a willingness to enact pension reforms. Wisconsin’s “shared risk” pension plan and relatively modest benefit structure have kept the state’s promises limited and its pension system healthier than most for decades. Michigan pioneered comprehensive state pension reform. Back in 1997, the state froze pensions for some state workers and created 401(k)-style plans for them going forward. And Rhode Island enacted major pension reforms in 2011. That’s one of the reasons why the state’s benefits grew more slowly than the economy. The state introduced hybrid retirement plans, cut cost-of-living adjustments and increased retirement ages for both new and current workers. Illinois provides the perfect example of how out-of-control pension benefits can create a state pension crisis. Wirepoints analyzed Illinois pension and economic data stretching back to 1987 using data from the Illinois Department of Insurance. Our analysis found that Illinois’ total pension promises have grown exponentially over the past 30 years. Illinois’ 2016 accrued liabilities were 1,061 percent higher than they were three decades ago. In 1987, total accrued liabilities equaled $18 billion. By 2016, that amount had swelled to $208 billion. No other measure of Illinois’ economy even comes close to matching the growth in pension promises. That growth was six times more than Illinois’ 176 percent growth in general revenues over the same time period; eight times more than the state’s 127 percent growth in median household incomes, and nearly ten times more than the 111 percent growth in inflation. 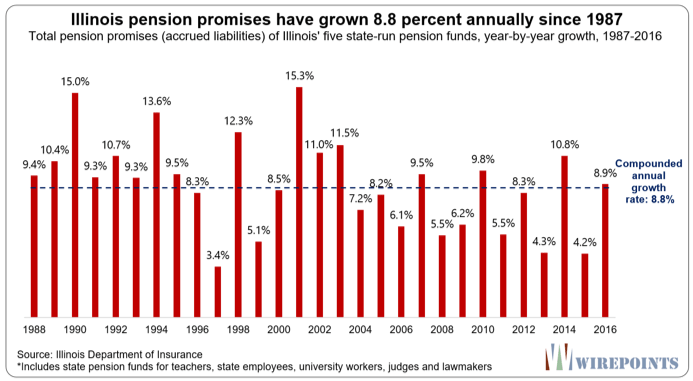 Illinois’ dramatic increase in accrued liabilities over the past three decades has been driven by three factors: overly generous benefits, pension sweeteners and a realization that pension promises were dramatically understated due to faulty assumptions. Add compounding to a retiree’s 3 percent cost-of-living adjustment. That doubles a retiree’s annual pension benefits after 25 years. Significantly increased the pension benefit formulas for the Teachers’ Retirement System, or TRS, and the State Employees’ Retirement System, or SERS. Provided lucrative early retirement options. Allow workers to boost their service credit by up to two years using accumulated unpaid sick leave. Grant automatic salary bumps to workers who earn masters and other graduate degrees. Allow for the spiking of end-of-career salaries. As a result of these changes, long-time state workers in Illinois receive overly generous pensions. The average newly-retired state employee who worked 30 years or more receives $68,100 in annual pension benefits and will see his or her yearly pension payments double to $140,000 after 25 years in retirement. In total, career workers can expect to collect more than $2 million over the course of their retirements. Illinois state workers also tend to retire long before their peers in the private sector. In fact, 60 percent of all current state pensioners began drawing pensions in their 50s, many with full benefits. Changes in mortality, investment rates and other actuarial assumptions also increased the amount of total pension benefits promised. In 2016 alone, assumption changes contributed to $10 billion of a $17 billion jump in accrued liabilities. Interestingly, Transparent California recently analyzed California pensions over the same period, 1987-2016, and discovered similar results. The state’s accrued liabilities grew nearly 900 percent in total, far faster than any other economic indicator. 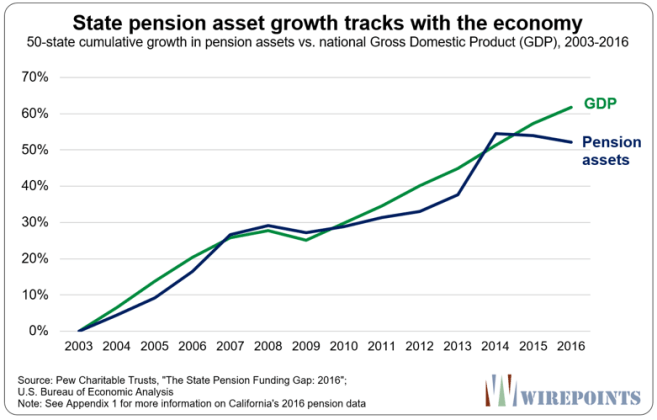 On average, state pension assets nationally grew 3.7 percent a year through 2015, almost identical to the 3.8 percent annual growth in GDP over the same period. That trend was thrown off track in 2016, a year of poor investment returns. The accrued liability/asset dynamic of the past 15 years is particularly important because in 2003, the (weighted) average funding ratio across all state pension plans was 88 percent. If all legislatures had taken steps in 2003 to ensure that pension promises would not grow at outrageous rates – especially in states that lowered their assumed investment rates – many states across the nation would not be in crisis today. 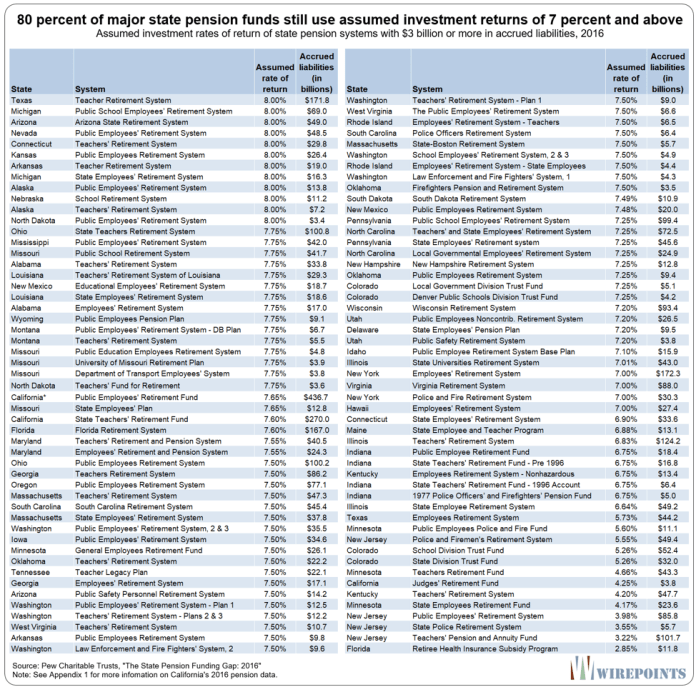 As with pension promises, there is a lot of variety between states as to how much pension assets have grown. Nearly half of all states grew their assets faster than their economies, an outcome that helped offset rapidly growing pension promises. But that wasn’t enough for many states to keep up with the full pace of their promises. At the top of the asset growth list are states like West Virginia, Nevada, South Dakota, Idaho, Nebraska and New Hampshire. All those states saw their pension assets grow more than 6 percent a year between 2003 and 2016. And all of them but New Hampshire are well-funded in relative terms. They have pension funding ratios of anywhere between 72 and 97 percent. Another exception to the rule is Illinois. It had the 8th highest pension asset growth in the nation, yet it’s just 36 percent funded. That’s largely a function of the Prairie State also having the 4th-fastest growth in accrued liabilities since 2003. At the other end of the spectrum, Michigan, Rhode Island, Pennsylvania, Kentucky, and New Jersey all saw their assets grow less than one percent annually. That’s a big problem for most of those states, in particular for those with rapidly growing promises like New Jersey and Kentucky. It’s no surprise that New Jersey’s funding ratio fell from 93 percent in 2003 to 31 percent in 2016. The same goes for Kentucky, whose funding ratio collapsed from 88 percent to 31 percent over the same period. The lethal combination of collapsing assets and fast growing promises has dropped both states’ pensions into virtual insolvency. The pension crisis is currently wrapped up in a false narrative of underfunding – that residents have never contributed enough to state pensions. As long as that narrative dominates, higher contributions and tax hikes will be promoted as the only “solutions” to the crisis. It’s what states with the deepest crises are pursuing. In 2016, California extended a millionaire’s tax that’s poured billions into teacher pensions.New Jersey Gov. Phil Murphy and the state legislature have just agreed to a new tax hike package. And Illinois Democratic gubernatorial candidate J.B. Pritzker is fighting for a multi-billion progressive tax hike – on top of last year’s record $5 billion income tax increase. But the nation’s pension crises won’t be solved by piling higher taxes on to residents. “Underfunding” is just a symptom of the real problem plaguing pensions. 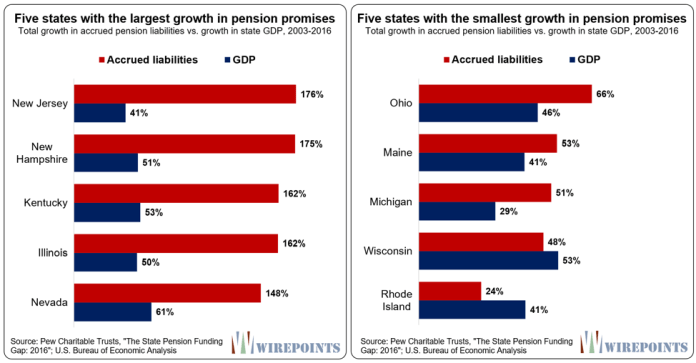 Each state’s crisis is unique – but a common factor across almost all of them is a rapid and uncontrolled growth in accrued pension liabilities. The states’ pension crises will only be solved when there is a reversal in liability growth. And that reversal will begin when states, the media, and politicians finally address the crises as a problem of over promising, not underfunding. The Pew data includes a revaluation of assets and liabilities by California’s Public Employee’s Retirement System (CalPERS) that occurred in FY 2016 under new GASB 67 and 68 accounting rules. As result, Pew was unable to provide a like-for-like comparison between CALPERS 2016 data and previous years. In order to achieve a more like-for-like comparison, Wirepoints used CalPERS’ reported asset and liability data from the fund’s official 2016 actuarial report as a replacement for the Pew 2016 data. Wirepoints’ analysis does not directly address the generosity of individual pension benefits. Our analysis only examines the growth in total pension obligations – each state’s aggregate promises to its active workers and retirees. In other words, this report focuses on the growing accrued pension liability faced by states, just as other reports address the growing aggregate of other debts. 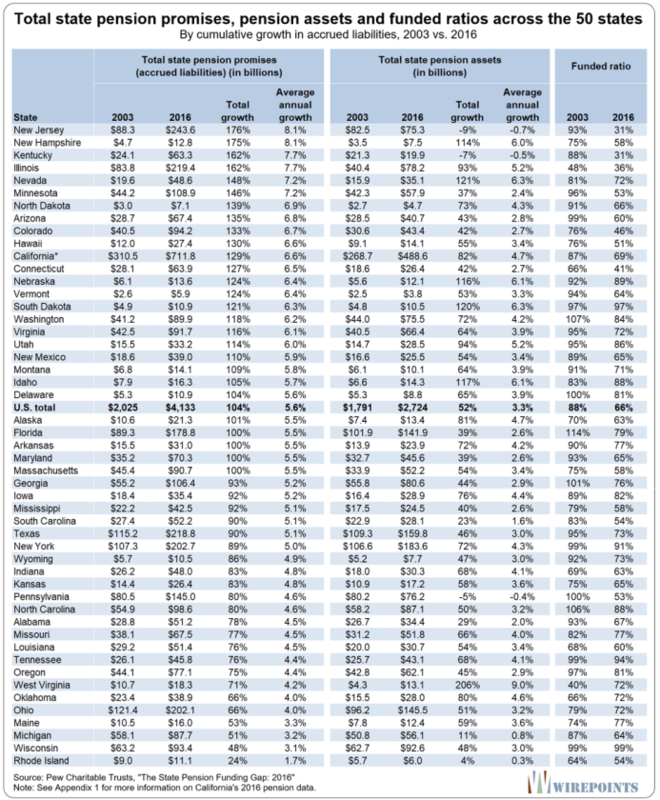 Comparing an individual state’s growth in pension benefits to another state’s is difficult because the math behind each pension system varies widely. The government employees covered by the state pension systems differ from state to state. For example, California’s state funds cover local/municipal employees while Illinois’ state funds do not. The benefits offered to workers also differ, as do other perks tied to retirement. For example, some states offer compounded cost of living adjustments and early retirements while others do not. Each state’s actuarial assumptions and the changes they’ve made over the years also vary. A pension system’s assumed rate of return on investment has a major impact on its accrued liabilities. States that have lowered their assumed rates of return during the 2003-2016 period will have, everything else equal, higher accrued liability growth compared to states that have not. The Pew data covers a relatively short period in regard to the nation’s pension crisis. Problems have been building in most states for decades, long before 2003. Longer-term data needs to be collected for a deeper analysis. However, the limited data available still shows legislators continued to grow their obligations even as their states’ crises deepened during the 2003-2016 period. Despite its limitations, the Pew data provides a good proxy for how much politicians haveoverpromised pensions in each state. 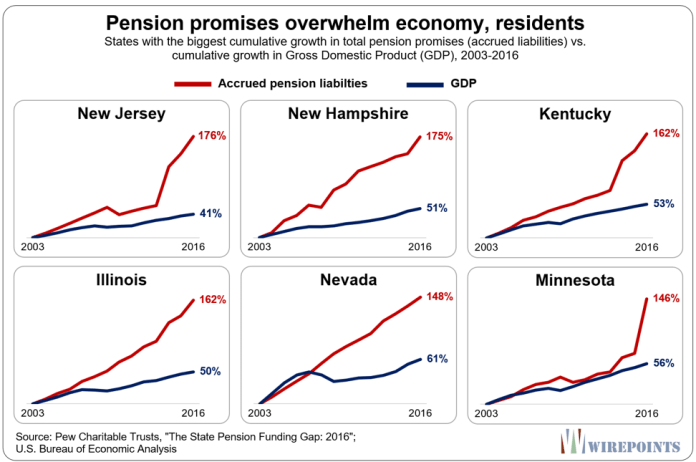 Wirepoints used the Pew Center’s pension data and economic data from the Bureau of Economic analysis to calculate each state’s total pension promises as a share of GDP. Because state pension assumptions, membership and benefits differ widely from each other, Wirepoints does not compare promises as a share of GDP across states. Instead, our analysis looked at the change, over time, in each state’s accrued liabilities as a share of GDP.